The choice of office furniture models used at the workplace today is important because they have the direct impact on the employee's productivity and efficiency. The resultant effect is on the productivity output of the company in which case is greatly affected by what happens to the employee's daily working capacity. In addition to that, there is also a need to have a workplace that is both physically and mentally conducive to effective communication while the perfect taste for ergonomics is duly fulfilled. This is why a lot of new design trends along with modern technological innovations are channeled to achieve these office feats. Modern office desks are the current fads of many workplaces today. However, it is important to note that that these desks are modern masterpieces crafted to bring more than aesthetic value. By and by as the need to achieve maximum productivity level heightens every day, so also does the need to stay longer and maximize every ounce of energy is essential for every employee. More importantly, the need to stay efficient and mentally alert at the workplace must be met. But how can these needs be duly met if the basic office tools which seem somewhat insignificant are not properly fashioned for these purposes? Beyond reasonable doubt, they have proven invaluable in keeping a healthy work style and thus achieve a productive time at the workplace. Desks are an important part of the working environment and an average desk in a workplace should be fully adjustable and switchable to cater for sitting and standing needs. This way, they can be of huge benefit rather than add to the misery that comes with a sedentary work style. While these desks come in different types and models, they have been carefully designed with specialized features to add more juice up your work experience. These are the desks you will find in many offices today and you can definitely opt in for one if you are looking to get a desk for your workplace. The Oberon writing desk is one desk ideal for office use as it provides a smooth surface for placing a laptop. It provides a wide work surface and is a good fit for students who need a good spread of their books whenever they need to read or study. It is also a suitable option for use at homes as it is ideal for writing, handcrafting and it promises a long lasting year of extensive use. It is lightweight, made with a wood paper laminate finish, and is very easy to set up. The Series[P] is a sit-stand desk which is designed with amazing features. It is designed to suit a flexible working style as you can adjust the height to the best position you deem fit. This implies that you can easily switch between sitting and standing to achieve the best ergonomics for your body at any time of the day. It is available in varying finishes and can be customized with smart accessories to make it fully functional. The Nexus multifunctional desk is a unique table with a fascinating design and can be adjusted to fit for several office usages. It is very flexible and customizable to achieve a dynamic work style and meet the workplace needs. It features a Flexrail system which allows you to add several accessories to it without having to use any tool. The desks which seem like individual pieces can be joined together so as to provide the wider working surface at both sides. It comes with different tabletop finishes including the polished nominate and eye-catching veneers all making it an attractive pick for every office. 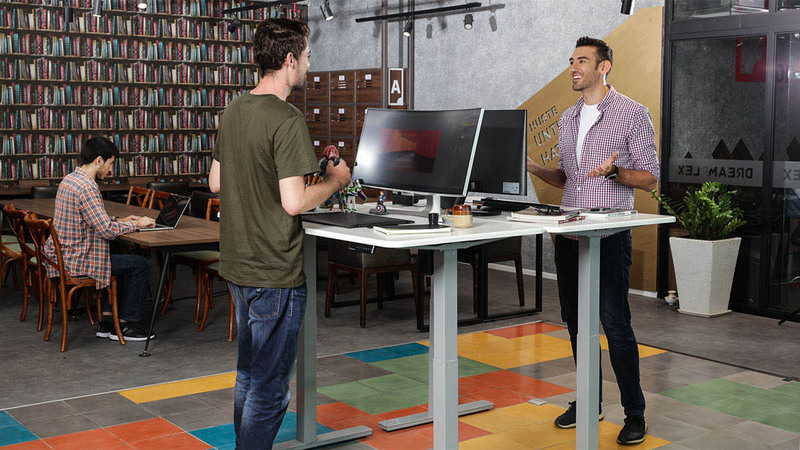 The autonomous smartdesk 2 comes as a timely solution to a sedentary work style. It is a unique sit-stand desk with a lot of features. It is an electric desk and it is fully adjustable to fit every user needs. The SmartDesk 2 is a blend of several amazing features along with extra power and efficiency. This desk is powered by two motors which allow it to raise easily without difficulty and lends to it extra standing strength. It comes in variant colors and in three different designs depending on your choice. The desk is height adjustable and can be alternated between standing and sitting positions to meet your ergonomic needs. The minimum height of this desk can come to is 24 inches and the height can be adjusted electronically by the control attached to the right side of the desk. This control has an automatic preset feature with which you can save four height positions of your choice and switch between them with just a press of the 1,2,3,4 buttons. The desk is very classy with a 53" x 30" rectangular dimension which makes it wide enough for holding up to three monitors without cluttering up of the spaces. This Smartdesk 2 is great office furniture to help maintain a healthy work style and keep you active all through the day. This is another amazing standing desk from Autonomous which provides an alternative option for choosing a healthy work style over a sedentary one. It has similar features to the business edition. However, it differs from the business edition in that it features only a motor. However, it is powerful enough to support weight up to 220 lbs and a single monitor. It has a sturdy design and consistent paint finish. Like the business edition, it also comes in different wood types and designs. It is fully adjustable and can also be switched between the sitting and standing positions. It comes with an electric control with which you can also enjoy the four heights preset feature by a tap of the buttons. This desk model is a top choice for most offices because it is very flexible and support different kind of activities you might be doing on it such as reading, working on a PC or just studying. An interesting thing is that it can be used by game lovers to set up their gaming gizmos on. It can also be adapted for several purposes and will fit well for home use too. It also provides shortcuts with which for easy navigation and to enhance productivity. It features dual electric motors which lend to it extra power to support as much weight as possible without wobbling. The Nano desk is a customizable desk with promises of flexibility and comfort. It is a functional desk which can be adapted for traditional settings and for office use. The desk is a complete masterpiece and can be linked with other desks of this same model to provide a wider work surface. It features neat cutouts along with a unique Flexrail system which allows it to be compatible with different accessories you might want to add. This desk comes in different furnishes and top laminates which provides a clean surface to make it better suited for smooth use in the office. It has a stylish design and it is very lightweight. This incredible desk is a neatly designed and highly sophisticated workstation which features an electric motor with which you can switch between standing and sitting positions at ease. It is fascinating office furniture which has curved edges and provides a surface on which you can rest your forearms while you type. The sloped edge also provides maximum comfort for your arms whenever you sit or stand at the desk. It features an intelligent 5-inch capacitive touchscreen which has built-in sensors to figure out whether you are at the desk or not. With this screen, you can save into the desk memory how frequent you want to stand and the desk will remind you whenever the time is reached. Just like the Smartdesk 3, this desk also learns of your preferences with time and automatically notifies you whenever you need to stand and take a stroll. It features a cable slot with which you can protect your cables. It also comes with two metal cabinets with which you can keep your unused cables and other valuable items. 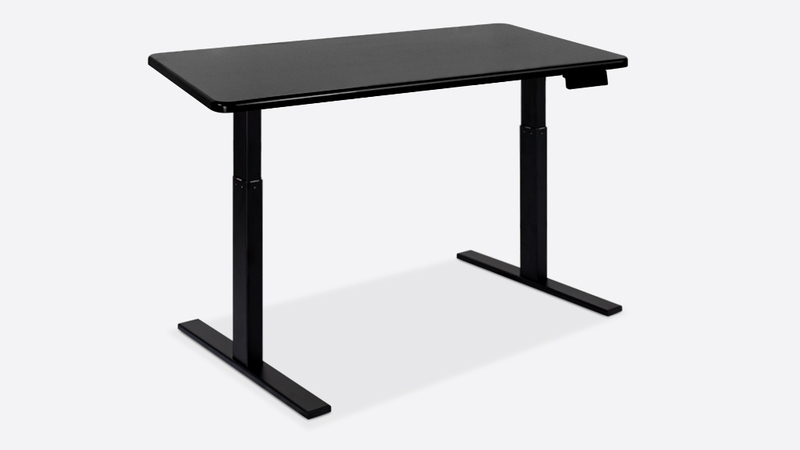 The Ikea Bekant Desk is an adjustable sit-stand desk with a stylish design and sturdy texture. The desk is adjustable in height between 22" to 48" to achieve an ergonomic working position. The motors are built into the legs of the desk and are definitely hidden from external exposure. The motors make a buzzing sound as the table top moves up- or downward though not audible enough to be disturbing. Moving of the table top upward and downward takes a very short time as the motors' speed is are very great. It comes with a robust veneer surface and is resistant to stain plus it is easy to maintain. It is also designed with an incredible cable management which makes it easy to keep the wire from cluttering the underneath of the desk and hence achieve a tidy workstation. The Arial Desk by Herman Miller is a very simple and minimalistic design desk which adds more aesthetic value when used in the office. It has an envelope shape and the desktop envelops you by sliding down toward your mid belt. The back portion of the top is referred to as the Outfield surface which is flat for holding items such as laptops, speakers or monitors. The table top has an Infield surface which is soft and also tough to provide support for the lower arms and the wrists. This desk helps to eliminate slouching of the back whenever you sit in the chair because it forces you to sit in the ergonomic position. It also helps to have a closer view of your monitor as you work on it. The desk is not fully adjustable; however, it can be adjusted through a small range of height for average standing and sitting positions. This is because it is not originally designed to offer sit-stand flexibility. One of the difficulties you might encounter is the need to flip the desk over whenever you have to make an adjustment. The above desks are definitely a product of modern technological innovations aimed at achieving a more flexible way of working in the office. They are individually designed with different features to meet ergonomic needs which may arise from working at the office. With these desks and many more out there, working in the office has never been made better and comfortable. However, when looking out to make a purchase, it is important to opt in for a height adjustable model as it provides more flexibility and allows you to switch between standing and sitting positions.